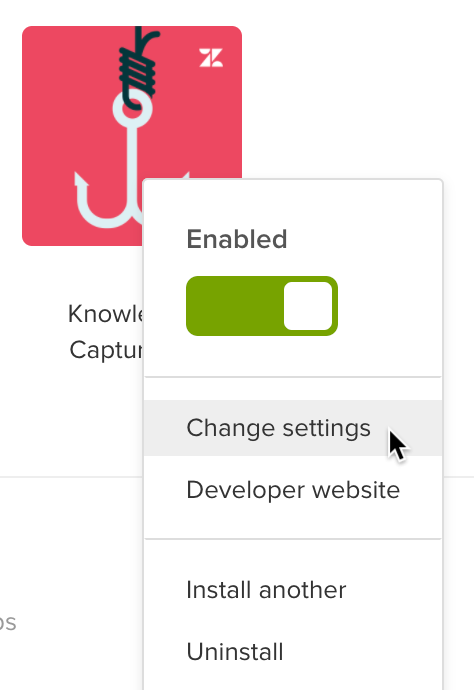 By default, the Knowledge Capture app location is in the editor toolbar in tickets. This makes it easy for agents to access the app as they work the ticket. Althernatively, the app can be in the apps panel in the sidebar location. You can choose the app location to be an editor app, a sidebar app, or both. Select or deselect Show in the Apps panel in the ticket sidebar. Select or deselect Show in the ticket editor. I cannot find the App Configuration in the settings page. The setting will be in the Knowledge Capture app v2 coming April 20th. There is no auto-fill anymore, while typing an agent has to press ENTER to see results. I believe there was an auto-fill in the previous version, which increased the usage of the app. The new location is very much hidden for agents, so we re-enabled the old position in the right app dock. The search doesn't include partial matches. If the ticket's subject is "I have a question about SSL" there are no results, even thought we have many articles about SSL, such as "The importance of an SSL-certificate"